CHICAGO, Dec. 21, 2017 /PRNewswire/ -- Today Conagra Brands, Inc. (NYSE: CAG) reported results for the second quarter fiscal year 2018, which ended on November 26, 2017. Net sales grew 4.1% and organic net sales1 grew 2.3% in the quarter with growth in each operating segment. The Company estimates that the recent hurricanes increased its net sales and organic net sales growth rates by approximately 220 basis points. Diluted earnings per share (EPS) from continuing operations grew 107.7% from $0.26 to $0.54 in the quarter; adjusted2 diluted EPS from continuing operations grew 12.2% from $0.49 to $0.55. The Refrigerated & Frozen segment continued its growth momentum in the second quarter with 4% volume growth. For fiscal 2018, the Company now expects its organic net sales and adjusted EPS to be near the high end of their respective guidance ranges. The Company bolstered its snacking and frozen platforms by completing the acquisition of Angie's Artisan Treats, maker of Angie's BOOMCHICKAPOP, during the quarter. Subsequent to quarter close, the Company entered into a definitive agreement to acquire the Sandwich Bros. of Wisconsin frozen sandwich business. 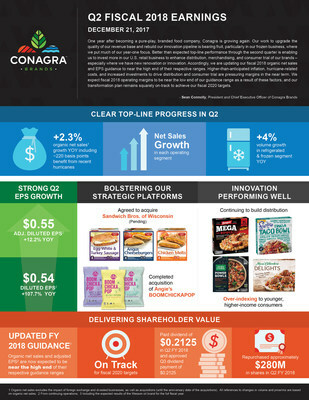 Sean Connolly, president and chief executive officer of Conagra Brands, commented, "One year after becoming a pure-play, branded food company, Conagra is growing again. Our work to upgrade the quality of our revenue base and rebuild our innovation pipeline is bearing fruit, particularly in our frozen business, where we put much of our year-one focus. Better than expected top-line performance through the second quarter is enabling us to invest more in our U.S. retail business to enhance distribution, merchandising, and consumer trial of our brands – especially where we have new renovation or innovation. Accordingly, we are updating our fiscal 2018 organic net sales and EPS guidance to near the high end of their respective ranges." He added, "Higher-than-anticipated inflation, hurricane-related costs, and increased investments to drive distribution and consumer trial are pressuring margins in the near term. We expect fiscal 2018 operating margins to be near the low end of our guidance range as a result of these factors, and our transformation plan remains squarely on-track to achieve our fiscal 2020 targets." Net sales grew 4.1%, and organic net sales grew 2.3%, reflecting continued improvements in domestic retail volume growth, partially offset by increased investments to drive distribution and consumer trial. The Company estimates that the impacts of the recent hurricanes benefitted the net sales and organic net sales growth rates by approximately 220 basis points. Gross profit increased $11 million from $648 million to $658 million in the quarter. Adjusted gross profit increased $5 million from $650 million to $655 million, primarily driven by volume growth. During the quarter, the Company experienced elevated input cost inflation, including higher transportation costs driven by the recent hurricanes. Additionally, the Company increased investments in its brands to drive distribution and consumer trial. These increased costs were partially offset by improvements in price/mix, primarily in the Foodservice segment, and supply chain realized productivity. Diluted EPS from continuing operations grew from $0.26 to $0.54 in the quarter; adjusted diluted EPS from continuing operations grew 12.2% from $0.49 to $0.55. The growth primarily reflects the benefit of fewer shares outstanding, net sales growth, and lower interest expense. These benefits were partially offset by input cost inflation, planned increases in selling, general, and administrative (SG&A) expenses, and a higher effective tax rate compared to the prior year period. Additionally, total marketing investments, which include advertising and promotion (A&P), trade, and slotting, increased in the quarter. Net sales for the Grocery & Snacks segment grew 6% to $900 million in the quarter. The acquisitions of the Duke's, BIGS, Frontera, and Angie's BOOMCHICKAPOP businesses added over 300 basis points to the net sales growth rate. Organic net sales grew over 2%. The Company estimates that the recent hurricanes benefitted the net sales and organic net sales growth rates by approximately 200 basis points, primarily driven by inventory builds in both customer warehouses and consumer pantries in the second quarter which are expected to negatively impact the third quarter of fiscal 2018. Volume increased over 3%, driven by hurricane-related benefits. Additionally, consumer takeaway trends improved in brands such as Ro*Tel, Chef Boyardee, Slim Jim, and Peter Pan as well as the microwave popcorn businesses. The Company invested in higher-quality merchandising events that aligned with consumer purchase behavior in the quarter. These investments, which are intended to drive increased brand saliency with consumers, led to a decrease in price/mix of 1%. Operating profit for the segment decreased 9%, and adjusted operating profit decreased 5%. The decreases were driven by the previously mentioned merchandising investments as well as the impacts of higher input costs and costs associated with the recent hurricanes. These increases in supply chain costs more than offset the favorable impacts of net sales growth, supply chain realized productivity, and decreased A&P investments. Net sales for the Refrigerated & Frozen segment increased 2% to $758 million in the quarter. Organic net sales increased 2%, aided by core business improvements and innovation launches by the Marie Callender's, Healthy Choice, and Banquet businesses. Continued growth in the core Reddi-wip business and the addition of frozen innovation launches by Frontera also added to the net sales growth rate. Volume increased 4%, driven by both core business improvements and innovation launches. Investments to drive distribution, enhanced shelf presence, and consumer trial led to a price/mix decrease of 2%. Operating profit for the segment increased 9% in the quarter, and adjusted operating profit increased 7%. The increases were primarily driven by volume growth and supply chain realized productivity. These benefits were partially offset by increased input costs and investments to drive distribution, enhanced shelf presence, and consumer trial. Net sales for the International segment increased 4% to $220 million in the quarter, and organic net sales were approximately flat compared to the year-ago period. Volume decreased 2% and price/mix increased 2% as the segment executes the value over volume strategy through reductions in promotional intensity, improvements in pricing and trade productivity, and planned discontinuations of certain lower-performing products. Foreign exchange favorably impacted net sales by approximately 400 basis points. The segment reported an operating profit of $20 million compared to an operating loss of $27 million in the prior-year period; the prior-year period included pre-tax goodwill impairment charges of approximately $44 million, driven by a devaluation of the Mexican peso. Adjusted operating profit increased 20% in the quarter behind increased pricing, favorable brand margin mix, and the impact of favorable foreign exchange. Net sales for the Foodservice segment increased 4% to $295 million in the quarter. The Company estimates that the recent hurricanes benefitted the net sales growth rate by approximately 10 percentage points. Volume decreased 7% as the segment executed the value over volume strategy by exiting noncore and lower-performing businesses. Price/mix increased 11% in the quarter, primarily driven by favorable product and customer mix, as well as the impact of inflation-driven increases in pricing. Operating profit increased 48% in the quarter driven by increased net sales and favorable customer and product mix. Corporate expenses decreased 60% to $45 million. Adjusted corporate expenses increased 27% to $46 million, primarily driven by an increase in certain self-insurance costs and a reduction in income from transition service agreements. A&P expense decreased 12% to $86 million in the quarter as the Company improved efficiencies and optimized total marketing investments. Equity method investment earnings increased $3 million to $21 million as the Ardent Mills joint venture benefitted from continued improvements in operating efficiencies. Net interest expense decreased 30% to $38 million in the quarter, driven by a significant reduction in debt during the year-ago period. In the second quarter, the Company paid a quarterly dividend of $0.2125 per share. As previously announced, the Company's board of directors approved a dividend payment at the quarterly rate of $0.2125 per share to be paid on March 1, 2018 to stockholders of record as of the close of business on January 30, 2018. In the second quarter, the Company repurchased approximately 8 million shares of its common stock for $280 million. As previously disclosed, on October 12, 2017, the Company issued $500 million aggregate principal amount of floating rate notes due 2020. The notes bear interest at a rate equal to three-month LIBOR plus 0.50% per annum. During the quarter, the Company closed the acquisition of Angie's Artisan Treats, LLC, the maker of Angie's BOOMCHICKAPOP ready-to-eat popcorn, for approximately $250 million. As previously disclosed, on May 30, 2017, the Company entered into a definitive agreement to sell the Wesson oil business to The J.M. Smucker Company. The transaction is subject to certain customary closing conditions, including the termination or expiration of the waiting period under the Hart-Scott-Rodino Antitrust Improvements Act of 1976 (HSR Act). Also as previously disclosed, on August 28, 2017, Smucker and the Company each received a request for additional information under the HSR Act (a second request) from the U.S. Federal Trade Commission (FTC) in connection with the FTC's review of the transaction. The parties are cooperating fully with the FTC as it conducts its review of the transaction. As previously disclosed, the Company announced that it has entered into a definitive agreement to acquire the Sandwich Bros. of Wisconsin business from Kangaroo Brands, Inc. The transaction is expected to close in early 2018, subject to customary closing conditions, including the receipt of regulatory approvals. The business has seen rapid growth with approximately $60 million in net sales for the twelve months ending November 2017. Organic net sales growth near the high end of the range of (2)% to flat. Reported net sales growth is expected to be 100 to 150 basis points higher than the organic net sales growth rate due to the impacts of acquisitions and foreign exchange. Adjusted operating margin near the low end of the range of 15.9% to 16.3%. Effective tax rate of in the range of 33.5% to 34.5%. This estimate excludes any potential impact from pending federal tax legislation. Adjusted diluted EPS from continuing operations near the high end of the range of $1.84 to $1.89. The Company continues to expect to repurchase approximately $1.1 billion of shares of its common stock in the fiscal year, subject to market and other conditions. Input cost inflation is now expected to be approximately 3.7% for the full fiscal year. This includes higher transportation costs driven by the recent hurricanes. The fiscal 2018 outlook includes the expected results of the Wesson oil business for the full fiscal year. Conagra Brands will host a webcast and conference call at 9:30 a.m. Eastern Time today to discuss the results. The live audio webcast and presentation slides will be available on conagrabrands.com/investor-relations under Events & Presentations. The conference call may be accessed by dialing 1-877-883-0383 for participants in the continental U.S. and 1-412-902-6506 for all other participants and using passcode 3074204. Please dial in 10 to 15 minutes prior to the call start time. Following the Company's remarks, the conference call will include a question-and-answer session with the investment community. A replay of the webcast will be available on conagrabrands.com/investor-relations under Events & Presentations for one year beginning Thursday, December 21, 2017 one hour after the conference call ends. This document contains forward-looking statements within the meaning of the federal securities laws. These forward-looking statements are based on management's current expectations and are subject to uncertainty and changes in circumstances. Readers of this document should understand that these statements are not guarantees of performance or results. Many factors could affect our actual financial results and cause them to vary materially from the expectations contained in the forward-looking statements, including those set forth in this document. These risks and uncertainties include, among other things: the ability and timing to obtain required regulatory approvals and satisfy other closing conditions for the pending Wesson divestiture and the pending acquisition of the Sandwich Bros. of Wisconsin business; our ability to achieve the intended benefits of recent and pending acquisitions and divestitures, including the recent spin-off of our Lamb Weston business; general economic and industry conditions; our ability to successfully execute our long-term value creation strategy; our ability to access capital; our ability to execute our operating and restructuring plans and achieve our targeted operating efficiencies from cost-saving initiatives and to benefit from trade optimization programs; the effectiveness of our hedging activities, and our ability to respond to volatility in commodities; the competitive environment and related market conditions; our ability to respond to changing consumer preferences and the success of our innovation and marketing investments; the ultimate impact of any product recalls and litigation, including litigation related to the lead paint and pigment matters; actions of governments and regulatory factors affecting our businesses; the availability and prices of raw materials, including any negative effects caused by inflation or weather conditions; risks and uncertainties associated with intangible assets, including any future goodwill or intangible assets impairment charges; the costs, disruption, and diversion of management's attention associated with campaigns commenced by activist investors; and other risks described in our reports filed from time to time with the Securities and Exchange Commission. We caution readers not to place undue reliance on any forward-looking statements included in this document, which speak only as of the date of this document. We undertake no responsibility to update these statements. 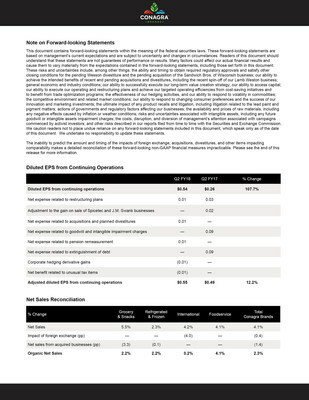 This document includes certain non-GAAP financial measures, including adjusted diluted EPS from continuing operations, organic net sales, adjusted gross profit, adjusted operating profit, adjusted corporate expenses, adjusted SG&A, adjusted gross margin, and adjusted operating margin. Management considers GAAP financial measures as well as such non-GAAP financial information in its evaluation of the Company's financial statements and believes these non-GAAP measures provide useful supplemental information to assess the Company's operating performance and financial position. These measures should be viewed in addition to, and not in lieu of, the Company's diluted earnings per share, operating performance and financial measures as calculated in accordance with GAAP. Segment operating profit excludes general corporate expense, equity method investment earnings, and net interest expense. Management believes such amounts are not directly associated with segment performance results for the period. Management believes the presentation of total operating profit for segments facilitates period-to-period comparison of results of segment operations.